Organize your laundry room with this stackable laundry basket storage. Storage is so important in a laundry room. 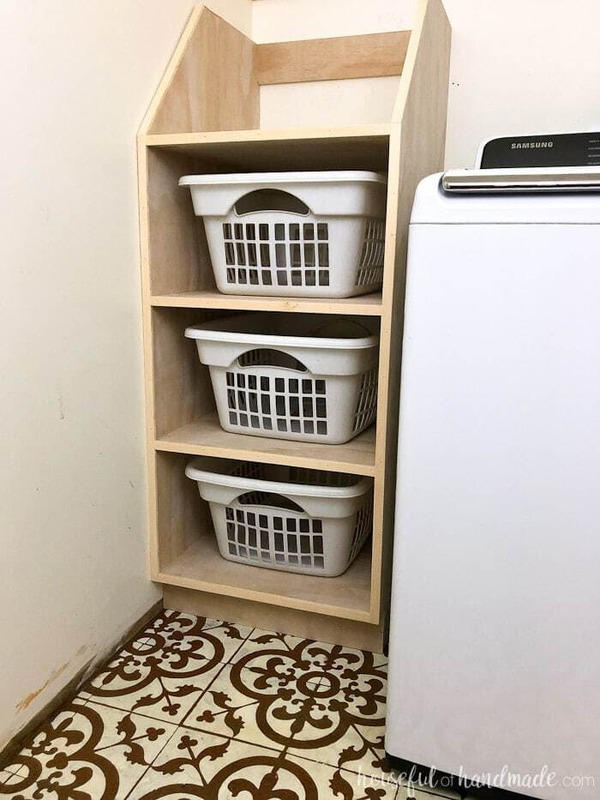 A stackable laundry basket storage is a great way to save on space but add tons of storage and functionality to a small laundry room or closet. This easy to build shelf unit is the perfect laundry basket organizer so you can keep your dirty laundry hidden. 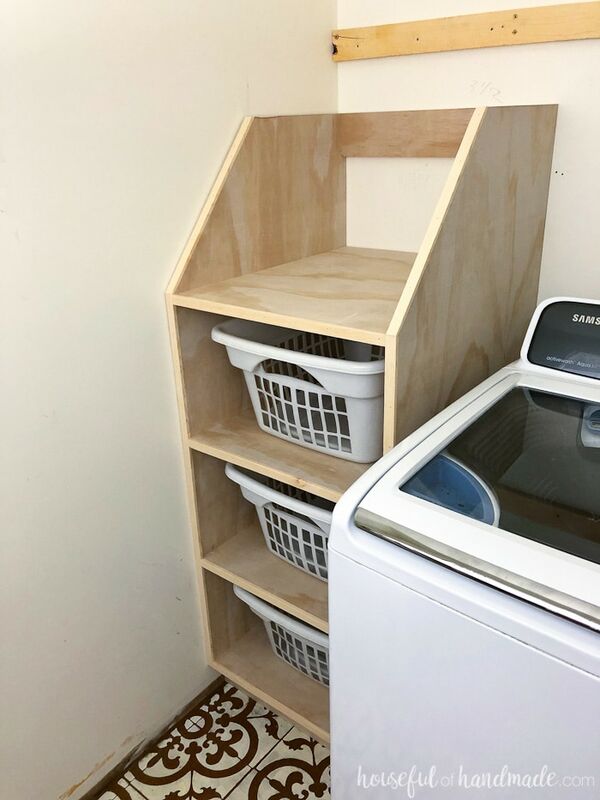 This quick to build shelf holds 4 laundry baskets so you can sort and store all your dirty clothes. And bonus, it is made out of 1 sheet of plywood so it is very budget friendly. 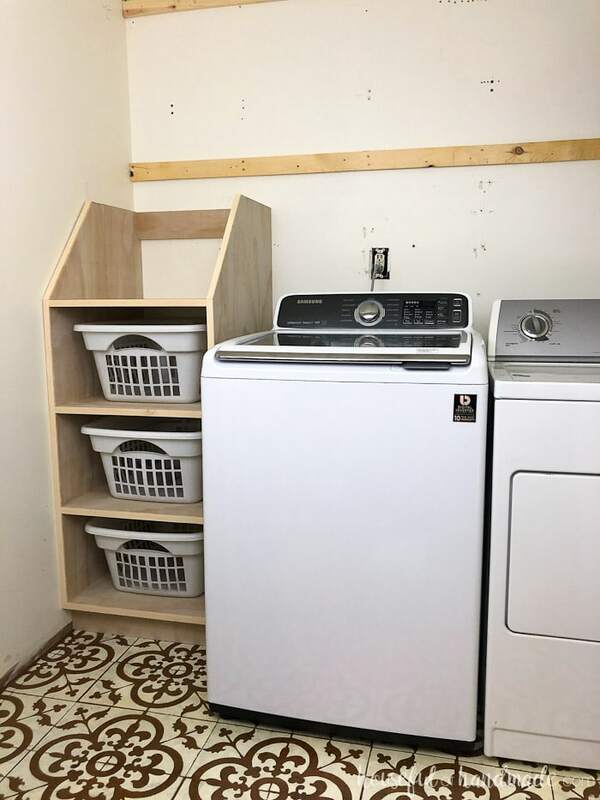 I cannot believe it is already week 3 of the $100 laundry room makeover. This week I was hoping to have so much done, but unfortunately I came down with bronchitis right after last week’s update. I have never had bronchitis before and it put me down for 5 days! Missing 5 days from a month long room makeover is a bit scary. There are only 14 days left and I have completed 2 of the tasks on my long list. This week will be a lot of work trying to get caught up! But enough about how behind I am, let’s talk about this amazing stackable laundry basket storage! Since I had room on either side of our washer and dryer, I knew I wanted to utilize it. I thought about adding a broom cupboard for storing cleaning supplies and such. But then I would have to go downstairs and retrieve my broom every day when I was sweeping up the kitchen (not going to happen). Then I realized there was enough space to add a laundry basket organizer. Right now our laundry baskets are just laid out in the hallway whenever I am doing laundry. The kids have to run the gauntlet of clothes piles and baskets on the way to their bedrooms (but I don’t think they really care). But it drives me crazy! So I decided to turn the extra space into a stackable laundry basket storage where all the clothes can be sorted and stored while waiting for their turn in the wash.
After making my decision of what to use the extra room for, it was time to go to the drawing board. I needed a way to add the glorious stackable laundry basket storage without breaking my $100 budget! If you remember from last week, I already spent $19 on the beautifully stenciled floor and there are still many more projects I want to accomplish in the space. I decided to sacrifice enough room in the budget for 1 sheet of plywood to create the perfect laundry sorting shelves. Now all I had to do was create the perfect plans for it! The laundry basket storage shelf does take a tiny bit more wood than the 1 sheet of plywood I planned for. It also used 2, 4″ strips of plywood for a toe kick and back brace (so I can attach it to the wall). Luckily I had a couple scraps of plywood in my stash to take care of this. 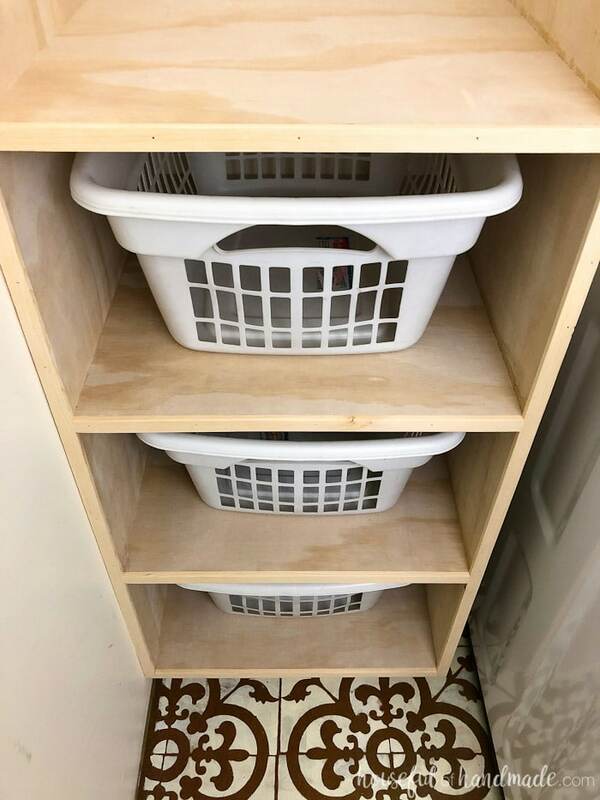 If you want to make your own stackable laundry basket storage and do not have scraps of plywood laying around, you can also use a 1×4 board for these two pieces. Easy peasy! 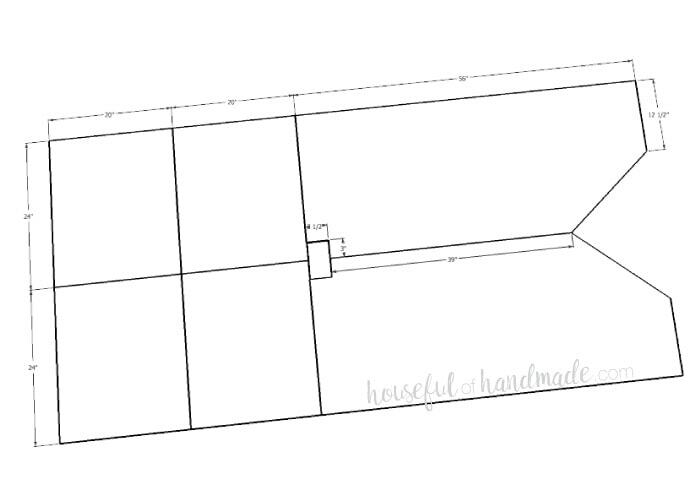 Before I share the build plans for the laundry basket storage, let’s talk budget! With only $100 to spend on the entire room, every little bit counts. 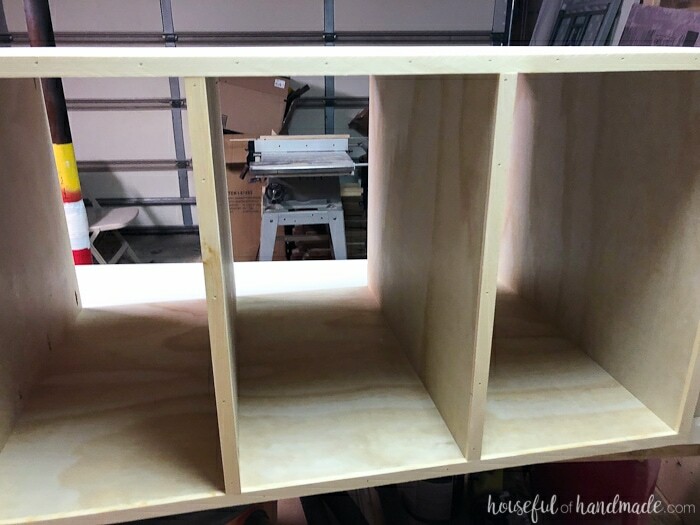 I am happy to report that paired with some scraps from my garage and thanks to my extensive screw collection (I never toss one, ever), I was able to create the perfect stackable laundry basket shelves for only $35! And that is all that was spent this week because I was down for the count most of the time. But there is still a huge list of things to do for the complete laundry room makeover! With $45 left, I may be getting a little nervous about the list. Wish me luck! I pair my circular saw with the Kreg AccuCut and RipCut to easily rip down sheets of plywood with amazing accuracy all by myself (something I could never do with my table saw). Optional: 1/4″ thick strips of wood or edge tape to finish off the edges of the plywood. Cut the plywood according to the diagram below. Drill 4 pocket holes into each side of all the shelf board. Set the Kreg jig for 3/4″ thick material and use 1 1/4″ pocket hole screws for all the joining. 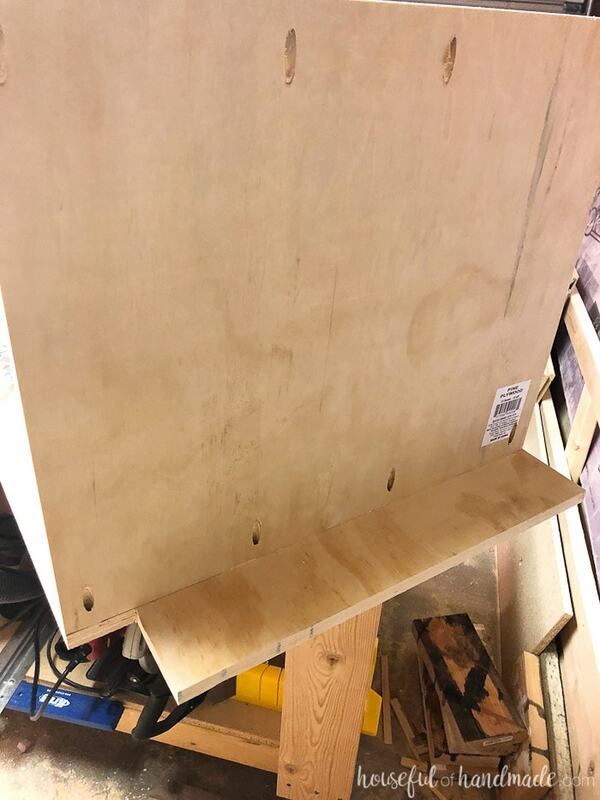 Attach the shelves to one of the side boards with pocket hole screws and wood glue. Secure them so they are 12″ apart. The bottom shelf will be flush with the top of the toe kick. 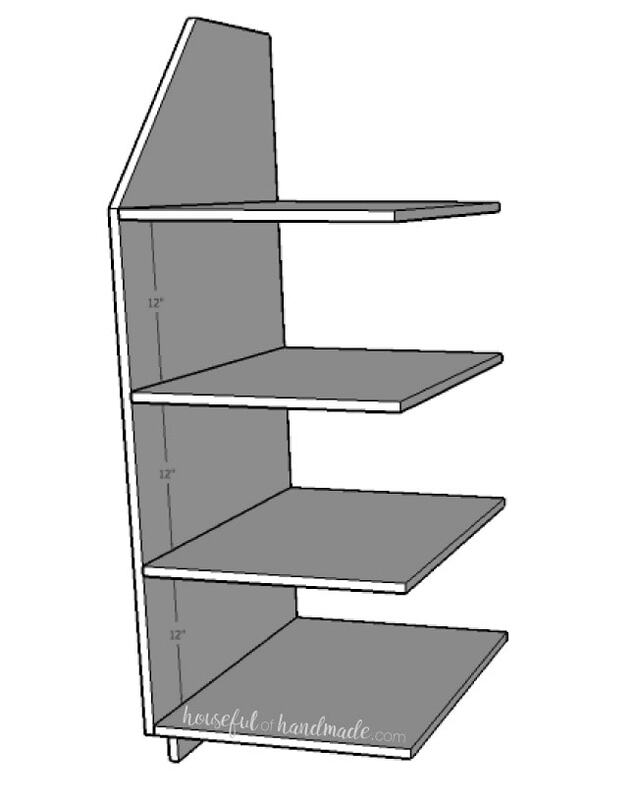 The top shelf will be flush with the top of the angled part of the side. 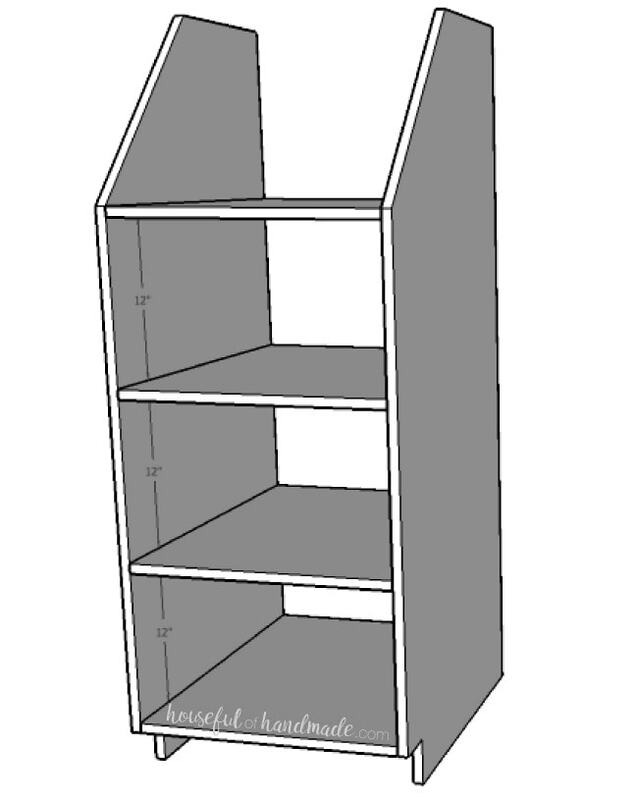 Attach the other side piece with the pocket holes on the other side of the shelves. Make sure to correctly space the shelves on this side as well to ensure square and level shelves. Cut the 1×4 board for the toe kick and back support. Attach the toe kick with wood glue and finishing nails. 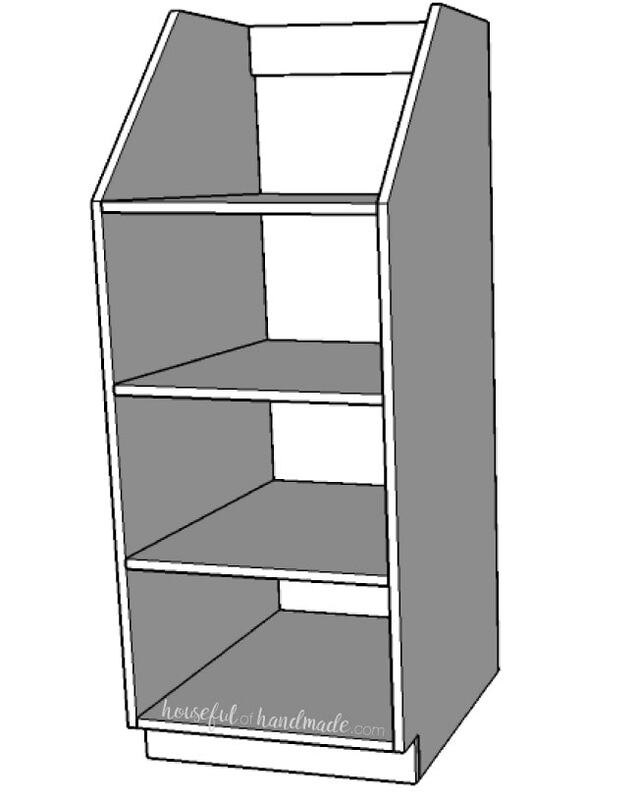 Attach the back support with two pocket holes on either side so it is flush with the back of the shelf unit. You can leave the shelves as it or finish the edges. I finished the edges with 1/4″ thick strips of pine wood (I ripped them down with my table saw but you can also do it with the AccuCut and circular saw if you support the AccuCut with scraps of wood). Attach the strips to the front of all the plywood with wood glue and finishing nails. Or you can finish the edges of the plywood with edge tape. However, finishing the edges of the plywood is not necessary. I didn’t do it in these plywood closet organizers and love the industrial look of the unfinished plywood. 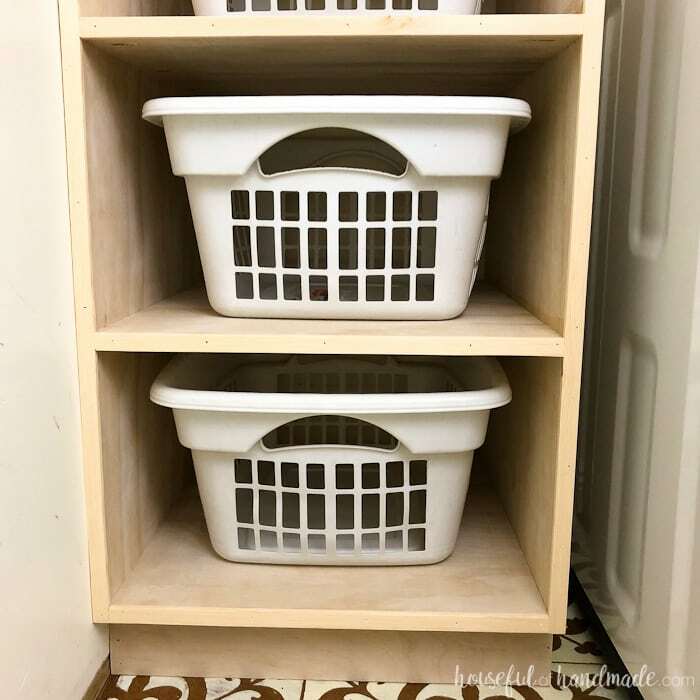 Now sand and stain or paint the finished stackable laundry basket organizer. This weekend I plan to get mine painted as well as the ugly 80s cabinets. I can’t wait to see the transformation after the paint is done! 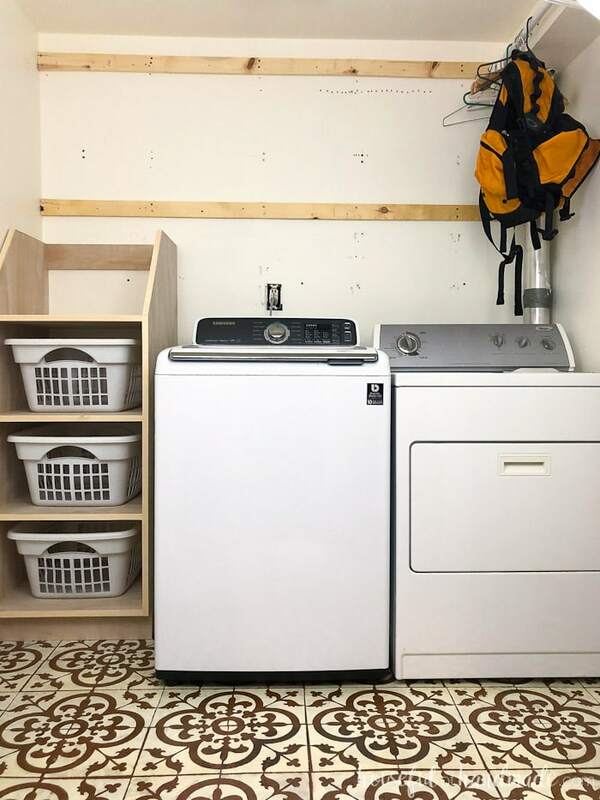 This $100 laundry room makeover is going to be amazing! Now don’t forget to check out the rest of this month’s $100 Room Makeovers. There are so many rooms to see and so much creativity to enjoy! What an AWESOME job!! I’ve wanted to do something like that for so long!! Hopefully now I can get working on it!! You will love it! it keeps our laundry so much more organized and off the floor!!! Love the laundry basket holder! So pretty! What can be done with a sheet of plywood (plus a few scraps) is pretty incredible! I LOVE this shelf, and so much better than all the baskets being in the hall! Hope you are feeling better! I am kinda a plywood addict if you haven’t noticed. I used one sheet in every $100 room challenge! Looking good! I wish I had room for a basket storage area in my laundry room. So glad you’re finally on the mend, Kati! We were hit with the flu this week so I feel ya! I so need a laundry basket tower in my laundry closet. I love how this one turned out! I can’t wait to see your progress next week! Oh no! I would not wish the flu on anyone. It was so awful. Hoping you all make it through quickly. This is a wow! An idea to copy for sure. Thanks for a great idea. Wish I had more time but as a caregiver I get busy and then tired! I love your shares. Thank you for that too! You are an excellent wood worker, I am amazed! Thanks so much Linda! It is hard to get things done when caring for others. I am lucky to have more free time now that my kids are in school. But we are loving our new laundry storage. Now the kids can easily help with sorting the laundry each week. So sorry you got down sick, but what a great shelf! You’ll be able to finish, keep your chin up! What a great use of that space. I would love to be able to store laundry baskets. Very clever.